Mystic Guardian is a JRPG-style game that lets you explore dungeons, bash monsters and complete quests for rewards and glory. Your adventure takes place in a fantasy-steampunk world that combines machine and magic and is full of diverse characters, monsters and deadly enemies. There are 2 playable characters and each character has a totally different story-line. There are also hidden stories within each story and multiple endings. The game’s hack-and-slash battle system employs a unique combo skill that lets players use the attack and skill button to deal damage to enemies. It also boasts over 100 skills, a host of weapons and armor. You will learn various recipes which can help craft consumables and other items. On your journey, you will encounter scores of enemies. Monsters and guards will attack in droves. Using one of any four active skills or the attack + combo button (SP) is the best way to defeat a group of attacking enemies. You will need to tap the attack button and then the “SP” button to use various combo skills, such as throwing enemies into the air and then slashing them, continuous damage and “wide and continuous damage”. When you press the attack button, the SP button is replaced by a combo skill icon. Each combo skill is denoted by a unique icon. Keep experimenting with different combo attacks, but if you want to know what works best, then the 4th combo, i.e. “wide and continuous damage” will help you take out lots of enemies. I would recommend using combo skills to attack normal enemies instead of an active skill as the latter has a cooldown time. Also, an active skill uses SP (denoted by the blue gauge displayed at the upper-left corner of the screen), and when it is consumed, it takes some time to refill, unless you are using an SP potion to quickly refill it. With combo skills, this is not a problem as the stamina gauge (consumed when using combo skill) replenishes quicker than the SP bar. You can, however, combine combo skills + active skill to deal max damage if you face tougher enemies. Normal: These are the ones that usually attack in groups and can be easily taken out using combo skills (attack button + Sp button). Strong: Such enemies have a “guard” gauge underneath their HP gauge. You will have to break their guard using combo skills. You can also use active skills if you want their guard gauge to decrease faster. You can easily kill them once their guard is broken. Shooting: These are ranged enemies that attack from a distance. They are weaker against melee attacks, so move your character near a ranged enemy and then attack him. Boss: They usually appear at the end of the main mission and are very powerful. Such enemies have 3 strength gauges and possess different attack patterns. A proper strategy would be to avoid getting hit by a boss (you can move around or run away to a corner to avoid his attacks) and then hit him when he is not attacking or in the least dangerous position. While adventuring, you will come across dungeons that act as an entry point to multiple dungeons. They usually have several doors, which need to be accessed one by one to enter another dungeon. After exploring a dungeon you will have to come back and select another door to enter an unexplored dungeon. When you come back to the main dungeon, you will see respawned enemies. Fighting them would be a waste of time when you can easily avoid them and move to the next door. There’s no need to kill all enemies in an explored dungeon as you can flee or use “Dash” (consumes SP, so use it wisely) to move past enemies. However, if there are too many monsters or guards and it’s difficult for you to move past them, then you can use combo skills to get rid of them. The mini-map is one of most useful features of Mystic Guardian. It not only shows your current position but also shows your destination, making it easy for you to choose the right path. You can also get access to the “Scroll of Return” (in case you have collected them during your adventure). The Scroll of return lets you return back to the world map, where you can choose previously explored locations. You can re-explore them for loot and rewards. Use it when you are lost in a complex maze of dungeons. Just tap it to view an enlarged mini-map. Also don’t forget to tap the name of your main quest to know your current quest (and side-quests if any). Fight enemies and complete quests to earn EXP and level-up. Once you reach a new level, you will receive stats points which can be used to raise your character’s abilities – STR (strength), VIT (vitality), DEX (dexterity) and INT (intelligence). You can allocate points to one or more than one ability. Allocating points to STR will increase damage to enemies. If you want to increase HP and armor, then add points to VIT. An increase in stamina and critical hit chance is possible if you add points to Dex, whereas an increase in combo attacks and critical damage is possible by allocating points to INT. There are two types of treasure boxes: normal wooden crates which can be broken in 1-2 hits and metal boxes that can be opened with a key. You can open a metal box with silver or a golden key. You can get a silver key from side quests. A golden key can be earned by completing the main quest. There’s also some chance of getting one after eliminating a large group of enemies. Chances of getting a rare item are high if the box is opened using a golden key. A treasure box replenishes every 3 hours, so you can come back again and use another silver/golden key to open it. If you are ill-prepared for a boss fight, then chances of your character dying before the boss are more. However, you can bring him back to life by watching a short video. Under “power resurrection” tap “watch ads” and watch a video if you want to resume fighting the enemy. Look for sparkling stars on a dungeon and move closer it to learn a new recipe. The recipe will be updated under “Skill” > Recipe section. Tap the recipe book that has an exclamation mark to know what materials are required to craft a new object. You might get materials by eliminating a large group of enemies. Look for materials on treasure boxes and crates lying scattered all around the dungeon. Go to the Blacksmith at “Iberk village” to upgrade your weapons. You will need certain materials and gold to upgrade your equipped weapon. You can get materials by breaking normal crates or from boxes. How do I equip gems and amulets to my gear? I’ve tried everything I think. Thanks in advance for the help. Where do you find the secret base where the Barbarians are hidden? I don’t know where to find it in Lorenz. How to use the summoners? 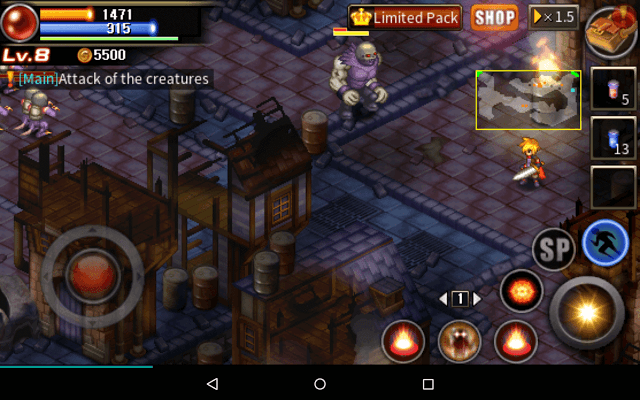 Hi Gin, To use the Summoners – On the top left corner of your screen, where it shows your character’s current level, there will be a (Red flashing ball) tap on it/ click it. It should activate your summoner. In doing so after your Summoner’s gone it will just be a matter of time after, (fighting a little bit) it will automatically refill itself. And that’s it. Where to find the zombie lord in the side quest “special dish”? How to defeat Boss Level 37 shade of ignit? On Secondary World. Please help. I need help someone please! With a quest called Sealed West Gateway. I have made to the door no problem. I get there and nothing happening? Machines not working/turning on the doors not opening am I doing something wrong please help me out. What do I do?? I would forever be in your debt. It’s android version! How to unlock raid mode? One of your characters should reach level 10 to unlock the first Raid level “Tower of Travelers”. You can then play it using 3 swords. Your character should reach level 30 to unlock the second Raid mode game (4 swords required to play it). Reach level 50 to unlock the third (requires 5 swords) and level 70 (6 swords) to unlock the 4th Raid mode game. What are the swords you collect for? I got 100 out of 12. Any help please? Swords are used to play Raid mode.